Your PTA, in partnership with Chabot administration, teachers, staff and the Oakland Unified School District, is committed to the continued excellence of the school. Changes in the funding formula applied by OUSD will provide extra support and funds to students who are in need. For Chabot, this means the PTA must provide more financial resources to fill the gap left by the reallocated funds. Put simply, your support and the role of the PTA is more important than ever. To read more about the OUSD funding formula and PTA financial resources click here. This year, the PTA will support enrichment programs, academic excellence and school site support with a budget of over $500,000. Your contributions help provide all Chabot students with social and emotional learning and enrichment programs including art, science, music, and technology (media) for an educational experience that applies to the whole child. Continue to boost teacher impact with support for in-class instructional assistants (small group specialist) to help ensure that all Chabot students can achieve their full potential. 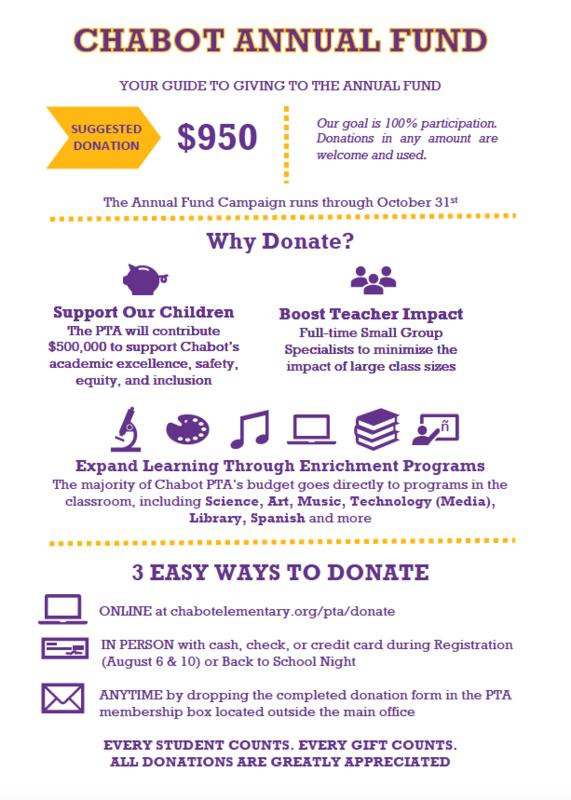 Our goal is for 100% of Chabot families to donate to this year’s Annual Fund. The suggested donation is $950 per child, but participation at any level is welcome. You can use PayPal to make secure payments to the Chabot PTA. To contribute online click here. In person with cash, check or credit card during Registration (August 6, 10) or Back to School Night (September 5). Download the donation form in PDF format and drop off the completed form in the PTA box outside the school office. Did you know you can you double your donation to the Annual Fund through a Corporate Matching Gift? Many companies offer matching gift programs to encourage employees to contribute to charitable organizations, like Chabot Elementary. Learn more by visiting the Corporate Matching Gifts page. Please contact Annual Fund Co-Chairs Meghan Horl, and Greg Kato at annualfund@chabotelementary.org.